Exciting times for everyone, the holiday season is beginning and to help ease the strain on our pockets instaGC have launched their Holiday Bonus! It’s linked to the Weekly Bonus and runs in a similar manner. What is the Holiday Bonus? The Holiday Bonus doubles the Weekly Bonus. Instead of earning up to 5% on your own earnings and referrals’ earnings each week, you can earn up to 10% from Sept 30th through Jan 5th! Plus, 50% of your total bonus earned for a week will “rollover” to the following week giving you a headstart in earning the highest bonus you can! How do I earn Bonus Units? There are two ways to earn Bonus Units. First is by referrals. You will get Bonus Units for every referral you get that also completes at least 1 task worth 5 or more points. 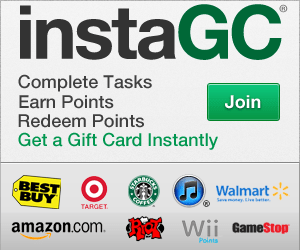 The other way to earn Bonus Units is by completing various tasks on InstaGC. You earn a range of Bonus Units for each task you complete. The more points the task is worth, the more Bonus Units you will receive, up to a maximum of 200 units a day. Click here to read about how you can earn bonus units in more depth. Where can I see how many Bonus Units I’ve earned? When you are logged into instaGC you will see a gift box in the header bar just to the right of your point total. If you click the gift box it will take you to the bonus page which shows you how many Bonus Units you have earned this week, as well as what your current bonus is. The instaGC week runs from Sunday to Sunday. Get 1 bonus point a day! « Swagbucks Swag IQ is now available in the UK!